Join us and Let Your Geek Sideshow as Susan and Kitty take a deep dive into the life of a synthezoid with a fifty year history in Marvel comics. Listen along while Susan and Kitty scan their brains to see if they can download enough data for The Vision Then & Now. What does it mean to be human? A common question asked equally among philosophers and people who read comics. Made from the memories of Hank Pym and the remnants of Ultron, The Vision has spent his time since his first appearance in 1968 asking himself that question and trying to cultivate the answer. What separates human from the superhuman? Is it our actual flesh and blood or simply brain scans and downloadable data into a synthetic body? From his inception to now, The Vision has been on a journey to define himself, and to find love. 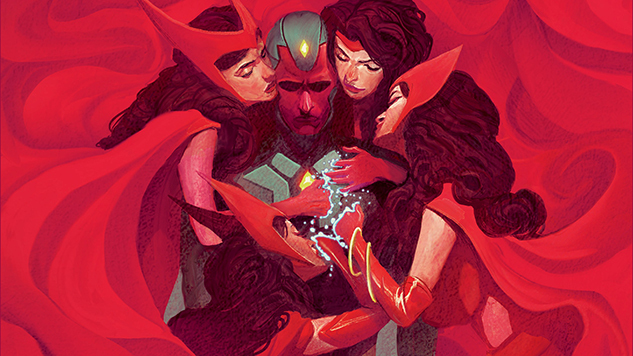 Whether with Scarlet Witch or with a family all his own, listen along to learn about the ways in which everyone’s favorite synthezoid has been saved by love- or trapped by it. We are proud to bring you pop culture content completely AD FREE, but that doesn’t mean we don’t need your support to help keep us going. If you enjoy Then & Now, please take a moment to leave us a 5-star review on iTunes, Spotify, or your favorite podcasting platform and help spread the word about our podcast. Be sure tune in for our other pop culture podcasts: Take a peek into geek culture and check out our Top 10 fandom favorites in the Geek Culture Countdown. Hear exclusive interviews with celebrities and pop culture industry leaders as they let their geek side show in Look Who Showed Up. Then, get all the latest pop culture news with our Daily Briefing, a two-minute breakdown of the biggest geek headlines perfect for your Alexa or Google news briefings.